Whether you love quiet time with a book or celebrations with the whole family, the Charle floorplan from Lennar Homes offers all of the elements of a great home and enough options to fit your family’s lifestyle. With unique spaces for entertaining, relaxing, and everything in between, your dream home is waiting at Shearwater in St. Johns County! Starting in the high-$200,000’s, this one-story home is approximately 2,142 square feet, with three bedrooms, two bathrooms, a sitting room, a traditional dining room, and a bonus café space off the large kitchen. Expansive 9’ ceilings greet you in the entry foyer and formal dining room, while a spacious gathering room at the back of the house connects to a covered lanai with a TV cable outlet—making it the perfect place to host a game-day party, or just relax and enjoy the evening. The crown jewel of the Charle plan is undoubtedly the generous kitchen and adjoining café. Any chef will be delighted to create memorable meals here, whether it’s for an elegant dinner party or a cozy Sunday breakfast with the family. Given the option to add granite countertops, stainless steel appliances and 42” cabinets, this room is easily customized to suit any taste. 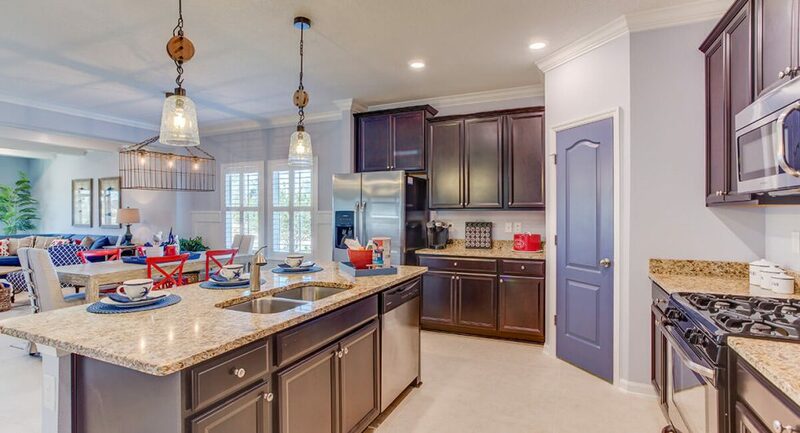 The Charle is just one of many floorplan options from Lennar Homes at Shearwater. With one- and two-story homes ranging in size from approximately 1,868-2,663 square feet, 3-5 bedrooms and 2-3 bathrooms, there’s something for every family at Shearwater. Lennar is offering homes in Shearwater starting in the high $200,000s. If you’d like more information on the Charle floorplan, or any of the homes Lennar has created specifically for the Shearwater lifestyle, come visit the models and speak with onsite New Home Consultants Rob Ambrosio and Matthew Zimmerman. Lennar Homes’ models are open Sundays and Mondays from noon-6:00 pm and Tuesdays-Saturdays from 10:00 am-6:00 pm.